It was so loud at the ’Dome on Saturday. Our fans, they’re just great. They have a noise meter they put in the crowd, I think they almost broke it. The crowd was awesome, for sure. It was fantastic to win at home, but wins always feel good. When you go on a little skid like that it’s always great to bounce back, it feels really, really good and all the boys are fired up about it. Our defence was outstanding. I was playing a lot with Mitch Wilde on Vancouver’s lefties and we had a good thing going there. But it’s not just me and him, it’s the whole 10-man unit, every time. We had a good game plan, really stuck to it and it worked well. Our defensive coach, Rob Williams, drew up a nice one for us so everything went our way tonight. It also helps having Christian Del Bianco back there. I played with him in junior so I’m really comfortable having him in net and letting him take the outside shots because I know he’s got them. 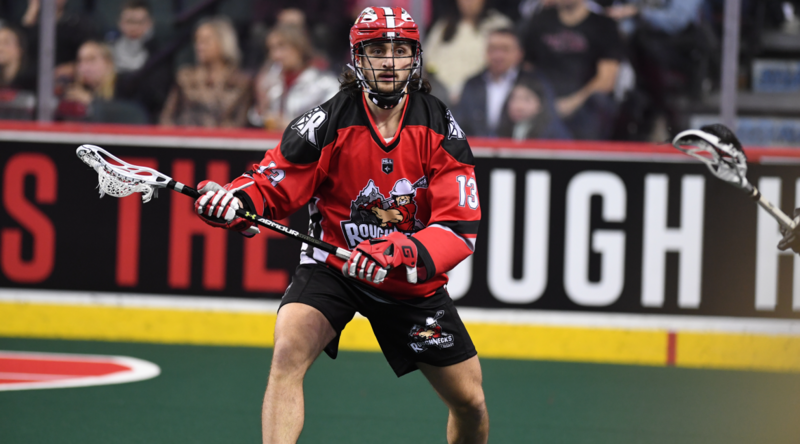 This coming weekend, we play the Saskatchewan Rush for the first time this year. I think we need to do more of the same, we can’t get too fat and happy over one win. It’s great to be back in the win column but we’ve got to rattle off a couple more. In this league, every game is a big one. We’re looking at improving our record; we’re .500 now so we need to get above that again. We also won’t be playing at home for over a month now, but the travel is not too bad. All the guys are flying in from wherever, so some of the games will actually be a little closer than Calgary and some will be a little further. It’s just the way the league is set up, so it’s not too tough. But we’ll miss our locker-room and definitely miss our fans.